Henderson involved the sign down issue in the context of UIM coverage under a commercial policy. According to the Opinion, the insured executed a proper sign down form back in 2008-09 under 75 Pa.C.S.A. § 1734 of the Motor Vehicle Financial Responsibility Law (MVFRL) under which the UIM coverage of $1 million was reduced to $35,000. Thereafter, in 2010-11, the sign down forms were not signed again and the only thing on the election form was that the insured wanted the minimum UIM coverage. Testimony from an underwriter confirmed that the forms only applied from year to year. The Plaintiff insured argued that there should be $1 million in UIM coverage under the policy because the form was not executed properly in 2010-11 and his accident occurred during that time period. The insurance company asserted that there was only $35,000 in coverage under the rationale that once a sign down form is executed, that form applied over the entire lifetime of that policy. Relying upon the Pennsylvania Supreme Court opinion in Blood v. Old Guard Ins. Co., 934 A.2d 1218 (Pa. 2007), the Federal Eastern District Court ruled that the insured was only entitled to $35,000 in UIM coverage regardless of the testimony offered up by the underwriter witness as there was no written request for higher coverage. The Henderson court noted that the Pennsylvania Supreme Court’s decision in Blood supported the decision that a sign down form is good through the entire lifetime of the policy unless the company receives a written request for higher coverage. Anyone wishing to review a copy of this Henderson decision may contact me at dancummins@comcast.net. 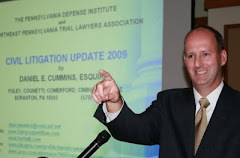 I send thanks to Attorney Scott Cooper of the Harrisburg law firm of Schmidt Kramer and Attorney Paul Oven of the Moosic law firm of Dougherty, Leventhal & Price for bringing this case to my attention.